Move over potato salad and coleslaw and make room at the picnic table for this Grilled Strawberry and Asparagus Freekeh Salad I created just for the California Strawberry Heart of the Farmer blog. Because, it’s strawberry season, ya’ll. Strawberries and summer go together like peanut butter and jelly (strawberry, of course!) Head over to the blog and check out the recipe, sign up for a chance to win a $200 gift card Crate and Barrel and read all about the #strawberrysummer campaign. Strawberries are naturally sweet but low in sugar (only 7 grams per cup), and provide a unique combination of essential nutrients, dietary fiber, and health-promoting phytochemicals. One serving of eight medium strawberries is only 45 calories. CA strawberries are an excellent source of vitamin C: More vitamin C per serving than an orange and 140% of the daily value. Turn on grill and set to medium heat. While the grill is preheating, cook Freekeh according to package directions. Clean, wash and dry asparagus stems. Place asparagus, olive oil, salt, and pepper in a plastic bag. Shake gently to coat the asparagus. Place on grill and allow to cook for 15 minutes or until desired tenderness is achieved. 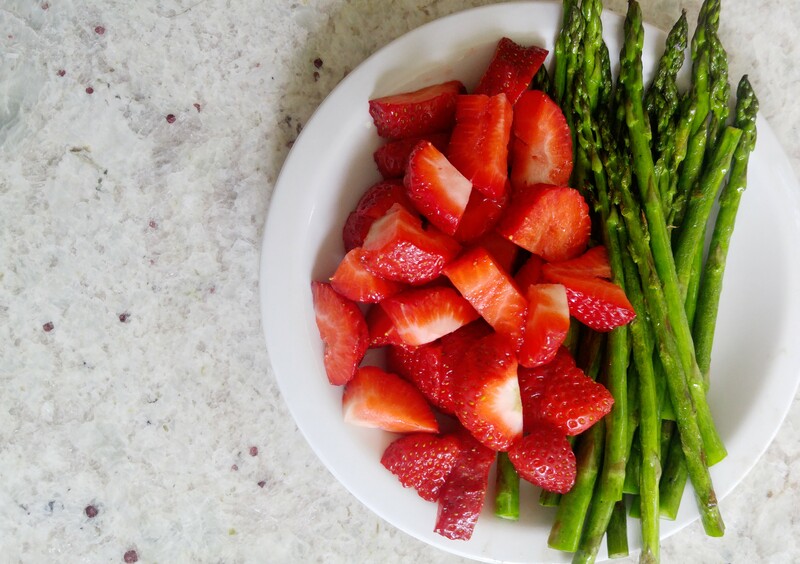 While asparagus is cooking, clean and dry whole strawberries (leaving stems intact) and thread onto skewers. Place on grill for about 2-3 minutes or until the strawberries are just soft. Remove from skewers; remove the stems and cut into halves or fourths. When asparagus is cooked, remove from grill and allow to cool. Chop into 1-inch pieces. 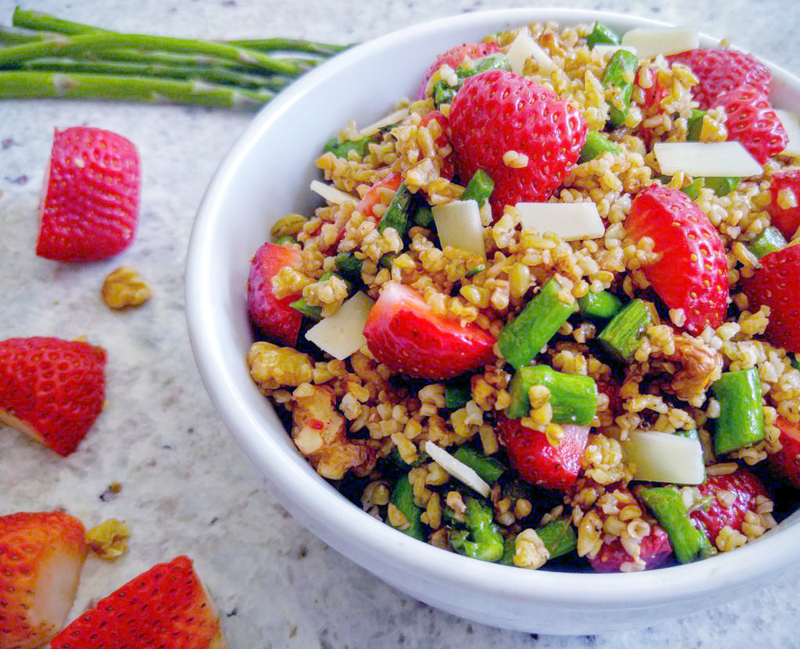 In a large bowl, gently toss ¾ cup of the cooked Freekeh, strawberries, asparagus and walnuts. Season with salt and pepper and drizzle with olive oil and balsamic vinegar. Top with freshly grated or shaved Parmesan.